In 2017 and 2018 I published A Firsthand Guide to Bled, Slovenia. This is the 2018 edition. For the book to have relevance, it needs to be written in Bled or soon after a visit. but as I can’t be there in 2019, I’m happy to provide this to anyone interested with the advisory note that parts may well be out of date. There are two reasons to shop; because you need something and because you want something. Sometimes you just want to shop. Food and day to day shopping are straight forward. There are several supermarket chains in Slovenia; Mercator, Tuš, Spar, Hoffer and Lidl among them. There are four or five Mercator in Bled. The biggest is Supermarket Bled at Kajuhova cesta 1. It opened in March 2017 and is great for a big family shop. There is a mid-sized Mercator in the main shopping centre which is handy if you want to pick up something for a picnic beside the lake. There are convenience Mercators at Campsite Zaka and at Mlino. There is another at Prešernova cesta 48, 4260 Bled, Slovenia beside the Speed Queen laundrette which is close to the main hostels. The opening times of the smaller shops depend on the season and the Mercator at the campsite is closed in the winter. As a rough guide, they are open by 8:00 am and closed by 6:00 pm Monday to Friday. Weekend opening hours are more limited. In the winter, for example Mlino is closed on Sundays. Opening times are displayed at the entrance. The nearest Tuš is in Lesce where you will also find Spar (Alpska cesta 34). Lidl and Hofer are out of town at Hraška cesta 22. When you are buying loose fruit and vegetables in the supermarket, after bagging what you want WEIGH THEM and get a PRICE STICKER before going to the checkout desk. That info was so important I used capitals. Huberto Široka is probably the best-known jeweller in Bled. His workshop is just opposite the Grand Hotel Toplice. Huberto was born in Zagreb in 1960 but spent his childhood in Paris and Bled. He started his career as a goldsmith at the age of 24. In 1990, he officially became an International Master of Fine Arts and decided to become an “independent culture worker” as he puts it. He has exhibited throughout Slovenia and further afield. Much of his work is inspired by what he sees and experiences around the town, the lake and the surrounding area. He says, “There is a lot of Bled’s history in my work, which I’m trying to maintain and add to with inspiration from the present-day. Years ago, I made one of the most beautiful archaeological finds “Peacock – bird of Eden”. It is a symbol of Bled and brings people laughter and happiness. Happiness comes when people laugh.” The peacock symbol is to be seen around Bled and is an important figure in Huberto’s work. Huberto’s workshop is at cesta Svobode 19 Bled. Near the Park Hotel these are many places to buy Slovenian souvenirs. One you might just miss but should visit is Mikame just beside the Devil Bar. “Mikame means I could be tempted.” Says Jakob Ribnaker the young owner of the business. Although I think he might be pulling my leg. I can’t find that translation. Enthusiastic, effervescent as only young people can be, and fluent in English, Jakob sells pottery made by his mother who lives in Bled. 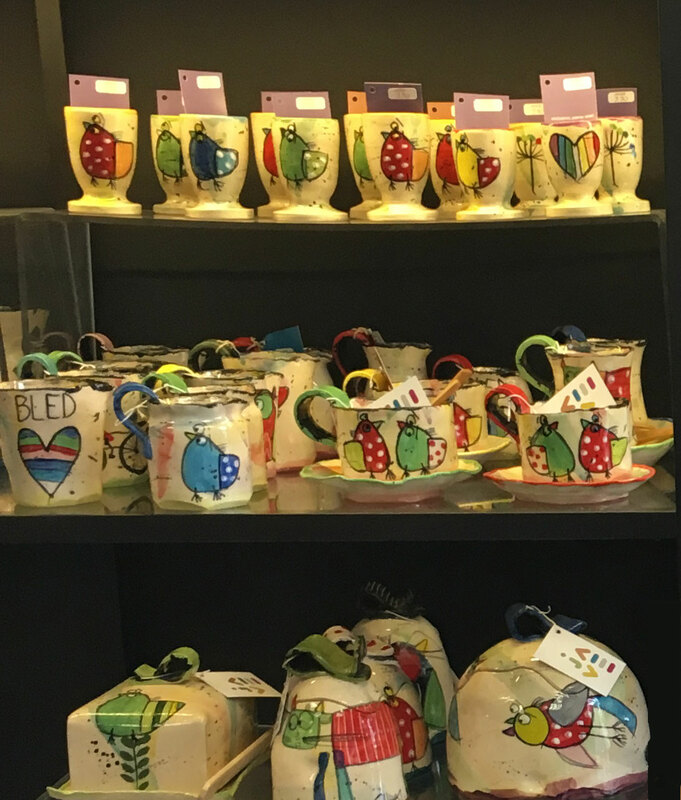 Quirky eccentric pottery, each piece unique decorated with childlike illustrations of birds and frogs. Vibrant colours, striking design. There are tulip shaped mugs on the shelf above with warm orange tones and bright flowers made by a neighbour. All the craft is Slovenian; much made nearby. The Arts and Crafts Fair on cesta Svobode near the Festival Hall is open every Friday, Saturday and Sunday from 10:00 am to 7:00 pm from Spring to Autumn. It features work by Slovenian crafts people and artists who staff the stalls themselves and are very happy to discuss what’s on offer. The Triglav Market is held every third Saturday in the month at the Information Centre, Triglavska roža Bled. It is open between 10:00 am and 12:00 noon. Occasionally, food markets pop up during the summer. The Italian market was a real treat for the eye and the taste buds. Some farms are open to visitors during the year. Homestead pr’Dornk is one. The 240-year-old building is in Mlino, 200 meters from the lake (follow the sign to Selo). They produce their own brandy, schnapps, beer and traditional food. They say that their Farmer snack is among their most popular. It is cold cut with a smoked minced bacon (Slovenian name is zaseka), dry sausage, prosciutto, domestic salami and cheese, and homemade bread. You might have to book ahead depending on the time of the year. There is more information on their website [dornk-bled.com/home]. In the centre of the town there are two principle shopping areas. One is mainly tourist shopping. It is in the shadow of the Park Hotel, the other is the Shopping Centre opposite which you can’t miss – even if you wanted to. The shopping centre is known locally as the Gadafi Centre. They say that the explanation as to why such an extraordinary structure is found on the shore of one of the prettiest places in the world is that it was originally intended for Libya. No-one has yet been able to explain to me why or how it was built in Bled rather than Tripoli. However, researching for this book I have found that the website for the shopping centre [www.shoping.si that’s “shoping” with one “p”] titles its homepage “Domov Gadafi” and “Gadafi” is a search term on the website. Perhaps it is more than a nickname. There are around sixty outlets on four floors set around a main piazza where you can sit out in the sun – shaded by big umbrellas – and order coffee, snacks and drinks. Which café will serve you will depend on where you sit. There are other bars, cafés and restaurants around the centre, but this is a great spot for simple coffee, snacks and people watching. You will also find clothes shops, sports shops, a tiny wine shop stocked with Slovenian wines. It is an open sunny and relaxed spot where you can sip drinks and top up your tan or find cooler corners under shade. Often in the summer, it becomes one of the town’s concert venues, especially for the Golden Microphone competition. More about that and other music events elsewhere in this book. Even if you are in Bled for a short time, have a quick look around. You might be able to buy everything you need here in one visit, then go on to enjoy what you came here to do.